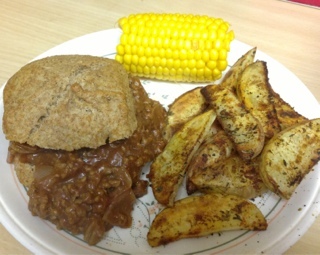 Slimming World Diary: SW USA Feast ..
Tonight I had USA Sloppy Joe's, Wedges and Corn on the Cob. Nice easy and gorgeous tasting dinner and for the whole lot it's syn free! I took the American method of sloppy Joe's and converted the ingredients so they are SW friendly. No syns but you have to use your HeB if wanting bread roll with it and it serves a family of four. 2. Place onions and garlic in a frying pan sprayed with Frylight, stir-fry for 5 mins then add minced beef and cook until browned. 3. Meanwhile sprinkle the wedges with the paprika and mixed herbs and place on Frylight sprayed baking tray and bake in oven for 25-30 mins. 4. To the minced beef add the passata, beef stock and Worcestershire sauce. Mix thoroughly and bring to the boil. Season and lower to a simmer. Cover and cook for 25-30 mins stirring occasionally until thickened. 5. Ten mins before the end of cooking time place the corn on the cob in a pan of boiling water and boil for 10 mins. 6. Cut the bread roll in half, place a large spoonful of the Sloppy Joe mix on top and plate up with the wedges and corn.